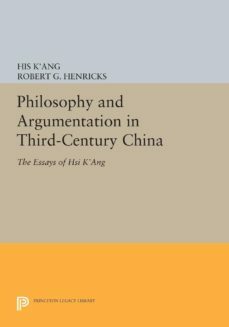 A valuable source of information on third-century Chinese argumentation and thought, the essays are eloquent, clear, and to the point; humorous at times; philosophically subtle; and psychologically perceptive. They treat matters of perennial concern--immortality, the nature of morality, the relation of music to emotion--and should be of interest to specialist and nonspecialist alike.Originally published in 1983.The Princeton Legacy Library uses the latest print-on-demand technology to again make available previously out-of-print books from the distinguished backlist of Princeton University Press. These paperback editions preserve the original texts of these important books while presenting them in durable paperback editions. The goal of the Princeton Legacy Library is to vastly increase access to the rich scholarly heritage found in the thousands of books published by Princeton University Press since its founding in 1905.